Do you enjoy viewing the daily leads emails except for the fact that you have to comb through a bunch of leads to find the leads that are relevant to you? After many requests, we have finally given you the power to filter the daily leads by the budget specified by the client so that you receive shorter, more relevant emails in the morning. 1. Log in to your Noomii account. 3. Click on "Email Preferences"
4. If you are unsubscribed to the daily leads email, click the slider from "Off" to "On"
5. 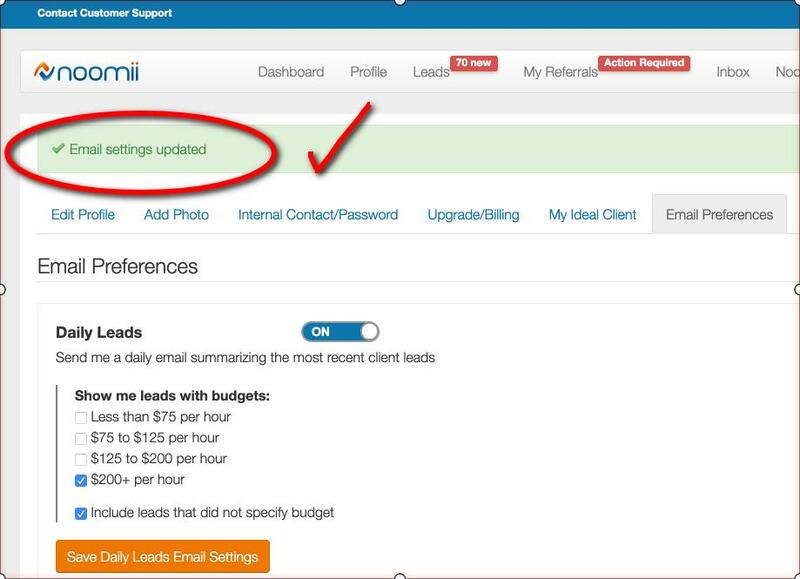 Select or unselect the budget values (checkboxes) to match your preferences and click "Save Daily Leads Email Settings"
6. Voila! Your email settings have been saved. Have you ever tried to recommend yourself to a client that appears to be a perfect fit and then you get notified that their gender preferences don't match your gender? That's so annoying. To solve that problem, we automatically remove the leads whose gender preference don't match yours. In other words, if you are a male and the client specifies "female coach only", you will not receive that lead in your inbox. Conversely, if you are a male and the client specifies "male coach only", you will receive that lead in your inbox. The same concept applies for both genders. To filter out leads that specify a gender other than yours, you don't need to do anything. The system will automatically filter out those leads for you.